Fan Wants TNA to Die Just Because He Likes Seeing Wrestlers Lose Their Jobs - WrestleCrap - The Very Worst of Pro Wrestling! Grand Rapids, MI – 27-year-old Sean Brethern was only fifteen when World Championship Wrestling went out of business, but he remembers it fondly. Now, the cart-retriever at Sam’s Club is hoping the same thing happens to Total Nonstop Action. Brethern was one of many WWE (then WWF) fans who rallied lemming-like being the Stamford giant as WCW crumbled before its ultimate sale to Vince McMahon. But the mere sale of the company wasn’t enough to satiate Brethern’s glee. “I loved watching WCW make mistakes, and I used to post “RIP WCW” on message boards and newsgroups back in the day. 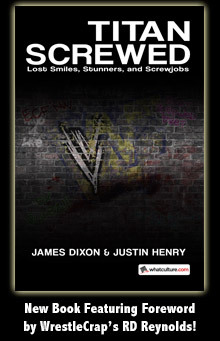 When it was over, and guys like Elix Skipper, Jason Jett, Dustin Rhodes, and others wound up in the indies, especially after Vince cut em, I was so happy, I could sing. But what happens if TNA dies, and WWE invariably takes in talented workers like Kurt Angle, AJ Styles, Bully Ray, and Bobby Roode? 15 Responses to "Fan Wants TNA to Die Just Because He Likes Seeing Wrestlers Lose Their Jobs"
This post brought to you by nearly every commenter on Lords Of Pain. I was truly sad when WCW died, and didn’t even know about WWE buying it until that night. TNA, I used to be a fan of, but haven’t watched in years, ever since Hogan buried Roode and changed the plans for his character. Ever since then Bishoff has regurgitated the NWO invasion a couple of times (Immortal and Aces and 8’s are both the NWO to TNA), and it has done nothing for the company. I don’t want TNA to close, but I want it to change, and I’ll admit, selfishly, back to what I liked about it in the first place. The X Division used to be about no limits, not weight limits (like Bishoff has made it WCW Cruiserweight 2.0). TNA used to have the best tag team division on the Planet, now they have a couple. Let’s not even mention what has become of the Knockouts, who at one time had a roster almost the size of the men in TNA, with battles just as epic. I do like how there’s no Headlies in the headline. Clearly this is a real story! Eh, I’ve seen some Crappers act like this, I’ve even acted like this before, so I can’t really talk. Still, TNA has been solid lately, but not great. Still needs something extra. Jarrett, Hogan, and Bischoff are about to kill yet another wrestling company with their outdated, bad ideas. It’s not the talent roster, it’s the ineptitude of those three, along with Dixie Carter. I’d say this is pretty much spot-on. Jarrett’s hardly involved up top anymore due to him getting Kurt Angle’s ex-wife so can’t blame him on that front. This is Dixie, Hulk, and Bischoff’s big fubar. I’ll never forgive Hogan and Bischoff if TNA dies. If it happens, that will be 2 promotions they’ve taken from us. Yeah, this Headlies is pretty spot on, on the wrestling forum I check every other thread in the TNA section is about them going out of business. If it happens, I won’t feel bad for Hulk, Dixie, or Bischoff, I’ll feel bad for the wrestlers, just like I felt about WCW. I just find it pretty amazing that one man and a handful of his employees are the only ones who can successfully run a national wrestling promotion. It’s not an issue of talent, like say for instance if you were to compare the NFL to the CFL, as TNA has many talented wrestlers, some who could be main eventers in WWE. It’s just the intelligence isn’t there in the office. It’s amazing, it truly is. #AskDixie is amazing. That is all. Hey Bischoff – RD Has Your Kryptonite! Now Free for Everyone!